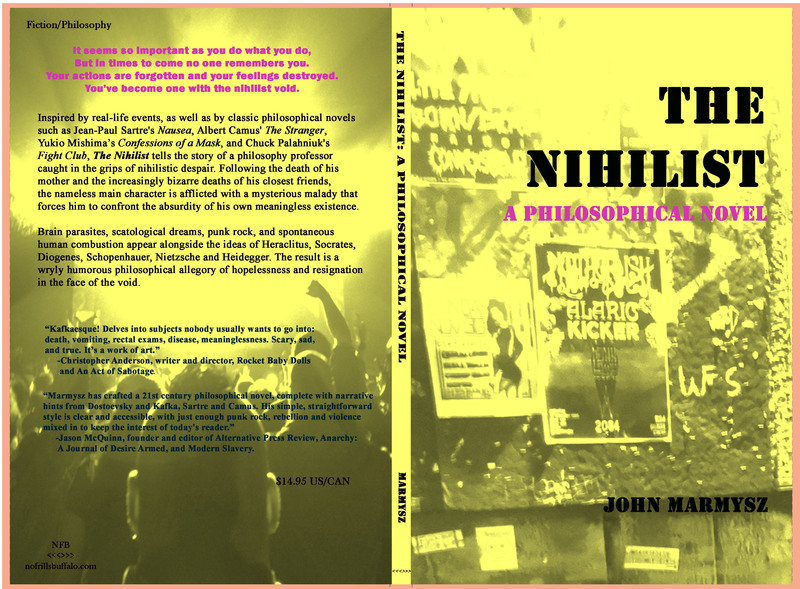 Inspired by real-life events, as well as by classic philosophical novels such as Jean-Paul Sartre’s Nausea, Albert Camus’ The Stranger, Yukio Mishima’s Confessions of a Mask, and Chuck Palahniuk’s Fight Club, The Nihilist tells the story of a philosophy professor caught in the grips of nihilistic despair. Following the death of his mother and the increasingly bizarre deaths of his closest friends, the nameless main character is afflicted with a mysterious malady that forces him to confront the absurdity of his own meaningless existence. Brain parasites, scatological dreams, punk rock, and spontaneous human combustion appear alongside the ideas of Heraclitus, Socrates, Diogenes, Schopenhauer, Nietzsche and Heidegger. The result is a wryly humorous philosophical allegory of hopelessness and resignation in the face of the void. “Marmysz has crafted a 21st century philosophical novel, complete with narrative hints from Dostoevsky and Kafka, Sartre and Camus. His simple, straightforward style is clear and accessible, with just enough punk rock, rebellion and violence mixed in to keep the interest of today’s reader.”–Jason McQuinn, founder and editor of Alternative Press Review, Anarchy: A Journal of Desire Armed, and Modern Slavery. “Kafkaesque! Delves into subjects nobody usually wants to go into: death, vomiting, rectal exams, disease, meaninglessness. Scary, sad, and true. It’s a work of art.”–Christopher Anderson, writer and director, Rocket Baby Dolls and An Act of Sabotage. “The Nihilist is an engaging and entertaining episodic novel that bravely excavates intimate topics to develop a philosophical perspective. –Benjamin Franks, University of Glasgow, author of Rebel Alliances: The Means and Ends of Contemporary British Anarchisms. “…the novel is rather funny and thoughtful in showing what living as a nihilist is like. An underlying force in the story, as in classical existential literature, is how the narrator refuses to give up even though life is meaningless. The Nihilist is a rich story that also finds comfort (albeit temporary) in other people.”– Finn Janning, author of Who Killed Gilles Deleuze?, The Happiness of Burnout, and You Are (Not) Mine. “Everything Will Be OK.” Review by Finn Janning. I can’t wait for this title. Any word on a release date? And a quick question for you, professor: if you could narrow it down to one piece of fiction, one piece that just exhudes nihilism, what would it be? Thanks in advance if you get the opportunity to respond. I’m so glad that this sparked your interest! The publisher is in the final stages of layout, so I’m hoping that it will be ready to go very soon; certainly before the end of the year. I’ll post an announcement when it is released. You could also email the publisher at the No Frills Buffalo website. In terms of one utterly nihilistic piece of fiction, I think that I would recommend Yukio Mishima’s Confessions of a Mask. I recently reread it and I think that it gives an excruciatingly honest and authentic voice to the author’s personal experience of nihilism.